Cuenca is situated in the Azuay province, in southern Ecuador. Many families, especially those living in rural areas, struggle to stay together and care for their children. The main reasons why families break down are poverty, migration of parents, domestic violence and drug abuse. Around 782,000 people live in the Azuay province. Cuenca is the capital city and around 400,000 people live here. The majority of people work in small firms, mostly in the service sector or producing handicrafts. The official unemployment rate is low, but a great number are underemployed. This means that many families lack stability and are in a vulnerable situation. In some areas of the province, mostly rural areas, over half of the population lives in poverty. There is a big difference between life in rural and urban areas: in towns around 70 per cent of people have access to basic services such as safe drinking water, sanitation and rubbish collection. But this figures drops down to only nine per cent in some rural areas. Many parents have decided that the only way to provide for their families is to move elsewhere, either to another area of Ecuador or abroad. The money they send back can pay for many basic needs, but also creates other difficulties. Children often live with just one parent, or more commonly, are left in the care of grandparents, aunts or uncles. In some cases, the lack of family stability results in social and psychological problems for the children who are left behind. In rural areas around one in five people can't read or write. Although the government has recently invested in improving education, many families can't afford the cost of sending their children to school. In some cases, children don't go to school because they have to work; they help out in the family business or in the fields. Child malnutrition remains a problem. Poverty and lack of information on adequate nutrition result in one in three children being malnourished. Many families don't have access to adequate health services. Girls and women need specific support: around 65 per cent of women have suffered violence. In many areas of the province, the number of teenage pregnancies is high, and rising. These young mothers often find it difficult to raise their children. 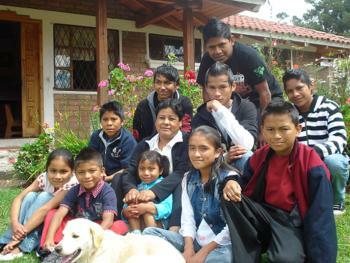 SOS Children's Village Cuenca began its work in 1997 in the small town of Ricaurte a few kilometres outside of Cuenca. We currently work throughout the Azuay province. Strengthen families: Working closely with the community and other organisations, our family strengthening programme aims to support families so that they can stay together. We offer a day-care programme and provide spaces where children, families and young people can meet and spend their spare time together. We also hold information events on nutrition and health topics that are open to the community. In addition, we give vocational training to local women, so that they can earn some money. Care in families: Children who are no longer able to live with their parents can find a loving home in an SOS family. In each family, they live with their brothers and sisters and are cared for by their SOS parent. Some of these families live integrated in the community. Wherever possible, children stay close to their family of origin and the community where they grew up. Support for young people: When young people from the village are ready to leave their family in order to complete their secondary education or vocational training, the SOS Youth Programme provides shared accommodation in Cuenca. With the support of qualified counsellors, the young people can plan their future, increasingly take on responsibility and prepare for independent adult life.